Photo challenge: share a photo of what “fray” means to you. 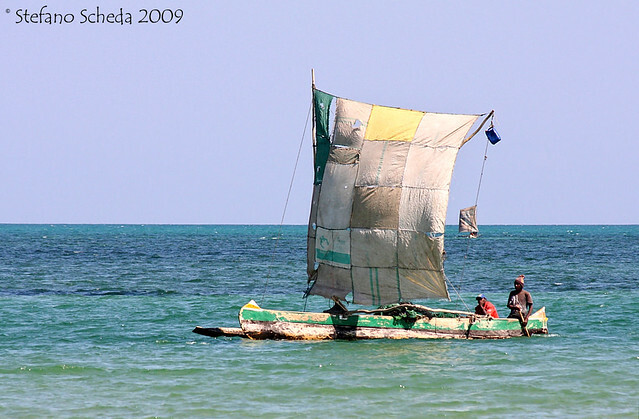 Fishing outrigger boat – Toliara, Madagascar. Molto bella ! Proprio centrata per il tema quella vela ! Love the colours, and the patchwork sail! Wonderful choice, Stefano. The boat looks frayed all ends up. Wonderful choice as always Stefano! Just love this one! The sail looks like a worn out table cloth. So many shades in the water as much as on the sail. A terrific choice for “fray”, Stefano! I’m glad you took that picture! That is a great photo, Stefano, I adore the colors!